If you are taking a group of kids to an art museum, concert, opera or other cultural experience it’s a great idea to teach them how to view things critically. 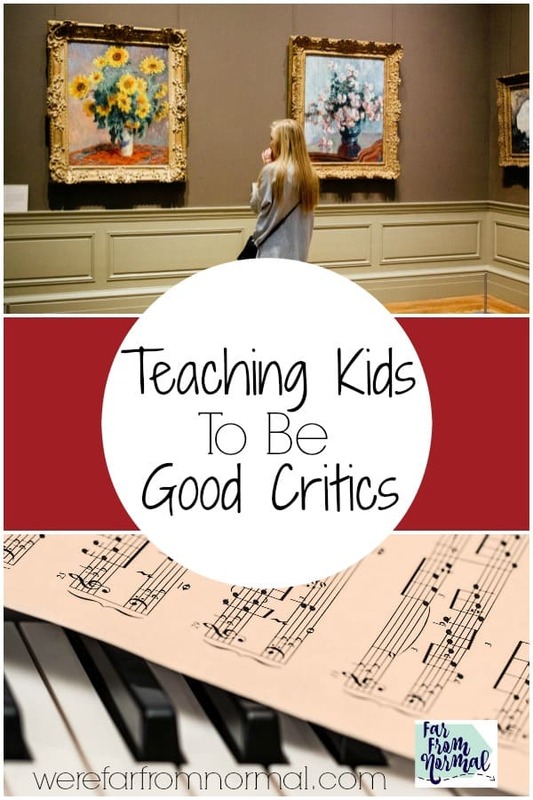 Here is a great activity for teaching kids to be good critics! I love field trips! So I scheduled a tour of our closest art museum so that the kids could see the art up close and personal. What’s cool is that this activity is really easily adapted. You can use it for art, music, theater, literature, pretty much any application that involves being a critic. I actually got the idea from an opera workshop I attended and adapted it myself to use with the art museum. The idea is to teach kids to be good critics by using appropriate words, good adjectives, and explain why they do, or do not like something. It’s a great brainstorming activity and can be done with one child or a group of kids. Here’s my activity for teaching kids to be good critics! The general idea here is to compare things, pick your favorite and tell why. —Explain what a critic is– ask the kids if they know. Talk to them about restaurant critics, art critics, and how they have to do a good job so that people will listen to them. Explain to them that every time they say if they like or don’t like something they are being a critic, and the better they are at describing why the better the critic they’ll be. — Choose three of something to compare. I chose apples, a granny smith, a red delicious and a honey crisp I cut them into bite size pieces to have ready to hand out to the kids. At the workshop we used barbecue sauce. You could use pudding, apple sauce, pasta sauce, cheese… pretty much anything you can get three different varieties of. — Next have the kids brainstorm. Use a white board, chalk board or piece of paper to write down what they come up with. Have them think of words they use to describe what kind of apples they like. My kids came up with crispy, juicy, fresh, sweet, sour. You want to encourage really great descriptive adjectives. Then we came up with words that describe what they don’t like. Sour made that list too, mushy, dry, bitter, bruised, were some others they came up with. —Hand out apple #1– have them eat it, and tell them to remember what they liked or didn’t like about it. — Take a vote– have them raise their hands of who liked 1, 2 or 3 the best. As they do have them tell you what they liked about them or didn’t like. Make them use the words you brainstormed, encourage new words. Talk about different aspects such as texture, taste, color. —Tie it together. Now translate the activity into whatever you are being critics of. Brainstorm again. What are good adjectives to describe art? Encourage again words that talk about color, texture, style, temperature, size, subject matter. —Practice Pull out a couple of pieces of art, or listen to a couple of selections of music, have them use their new skills and practice using words that might be new to them. We did this activity before our trip and I was so pleased when I heard the kids talking about what they loved about the paintings and what they didn’t. There was still some “that’s ugly” (even from me!) but for the most part we were all great critics! Teaching kids to be good critics isn’t difficult or boring, with the right tools they can learn how to express their opinions intelligently! What a great exercise! It sounds like it was a successful lesson and field trip!